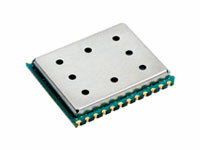 Product information "iM282A-L LR_Base Plus - Long Range Radio Module"
The 'iM282A-L LR_Base Plus' is a compact and low-cost radio module that operates in the unlicensed 2.45 GHz band and combines a powerful Cortex-M3 controller with the new ultra long range transceiver SX1280 of Semtech Corporation. It has been specifically designed for battery driven applications and is able to achieve without any additional amplifiers a LoS range of more than 10 km. Besides the modem services the firmware includes some example features which are typical for the application area of this LoRa® radio modules: a tiny sensor application which demonstrates a periodic sensor data transmission and a remote control with digital input/ouput via radio link. These embedded development tools and all the other features can be used in combination with WiMOD LR Studio which offers an easy to use configuration, logging capabilities and data visualisation. Related links to "iM282A-L LR_Base Plus - Long Range Radio Module"
Customer evaluation for "iM282A-L LR_Base Plus - Long Range Radio Module"